The highlighted area is the Province of Ontario. We are in Southern part of Ontario near the Great Lake - Lake Ontario. The Trillium - Ontario's flower. The GTA (including Acton) is considered to be in Central Ontario. There are a few other Acton's around including Acton Maine, Acton Massachusetts, Acton California and one of our favourites - Acton, UK. But only we are the world famous Acton! See my map page for a streetmap of Acton. You can find information and locations of Acton Schools on my school page or Acton stores on this page. Also check the links on the left side of this page for links to Acton stores and restaurants. For hotels and motels in the area you can check on this page. NEW: Check out my pages on nature trails in Acton. Acton resident Ann Hamilton has joined Avon (the company for women) as a sales representative and will be happy to show you some affordable makeup and beauty products in our brochure. Avon also carries a wide selection of products, including fragrance, jewelry and accessories, wellness products, unique gifts and home décor items. Contact Ann at 519-853-4653 or by email at ann.hamilton@sympatico.ca and let me know when I can give you the latest Avon catalogue and we can discuss your beauty needs. Avon Calling, can I call on you? 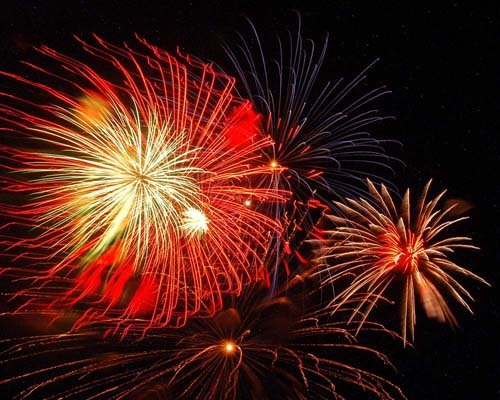 The Acton Firefighters Association is also responsible for the ever popular, spectacular annual Canada Day Fireworks in Acton's Prospect Park. Here is a picture that I took of the slightly damp 2009 fireworks. The Acton Firefighters Santa Claus Parade was Saturday, November 15, 2008 at 1pm. For some 2008 parade photos see this page. For a video highlight of the 2009 parade click here. Acton is a great little Town of approximately 10,000 people. It was amalgamated with the Town of Georgetown and incorporated as the Town of Halton Hills. Neighbouring towns and cities include Brampton, Milton, Erin and Rockwood. Acton is nice because it is just small enough to be a close community with a nice mix of residential, commercial and industrial so that you can live in work in the area. We also have elementary and high schools here. You can always walk to anywhere you want in town. What makes Acton perfect is Fairy Lake in Prospect Park which is great for sports, sightseeing or just relaxing. Located within the Greater Toronto Area (GTA) Acton is part of the Region of Halton. It is a typical small town in Ontario and probably the last one left in the GTA. The main street is made up of the old commercial buildings with the store on the bottom and apartments up top. It has some great stores including Judy's Country Reflections (Gift Shoppe at 39 Mill St E 519-853-1996) and Blue Springs Flowers and the famous Acton Olde Hide House - still open despite their recent financial problems. Acton and the Olde Hide House are forever joined because of their advertising slogan "It's worth the drive to Acton." Every time that you mention that you are from Acton someone has to say "is it worth the drive?" A nice thing about the Olde Hide House is that they have a complimentary refreshment stand located next to their indoor children's playground - note these have been closed off as part of the recent changes as they undergo their liquidation sale. There are a few historic buildings around including the old town hall and some semi-detached homes built in the early 1880's. View some pictures on this page. We have arenas, parks, Sobeys grocery store, McDonalds and the important stores - LCBO and the Beer Store. You can see pictures and locations of the stores on this page. There was very little growth in the town for so long due to problems with infrastructure supplies. However they have finally allowed some development to occur and Sobeys (former IGA) built along Highway 7 just on the east side of the Town (see a panorama photo of this area). Several residential subdivisions soon followed in the area. Ann works for Sobeys and we have posted some pictures of some of the previous parties/events at my.fotopic.net. We used to have a GO train stop for awhile but they took it away (maybe one day we will get it back). However we are still served by GO TRANSIT and you can get to Georgetown or Toronto by catching the GO bus in Acton (stops along Highway 25 and Highway 7) and then get on the GO train in Georgetown (line D in green). The Georgetown line GO train goes through Halton, into Brampton then into Toronto with a final stop at Union Station. The total bus/train trip takes 1.5 hours and is available twice in the morning. From Union Station you can take the TTC or walk through Toronto (above ground or through the PATH underground system - which is great in winter). The PATH system is great, it takes about 30 minutes to walk underground from Union Station to the Eaton Centre. Don't forget to print and take the map of the PATH system or you will get lost! In the fall we have a fair and a Leathertown festival and during the summer we enjoy Canada Day celebrations along with the Saturday "Trunk Sale" held in the parking lot of the Olde Hide House. For more event information see below. Acton also has a library, arena and swimming pool (in MSB School on Acton Blvd). There is also an outdoor children's swimming pool in Prospect Park next to the boat house (cost is $1 a child) - a great way to beat the summer heat and have some fun. I understand that the outdoor pool will be replaced with a splash pad. Within Prospect Park the Town has added a Rotary Club Bandshell. A new multi-use community building has also been built by the Acton Agricultural Society (Dufferin Aggregates contributed $200,000 to the Acton Agricultural Society’s “It’s More than Fair Campaign” to aid the construction). This will provide space for the Fall Fair, community groups and events and provide indoor soccer locations for the Acton and Georgetown Soccer Clubs. A sports action park (skateboard) park has also been added to the Acton Arena property - see a video here. And so close to us are many great Towns, Cities, attractions, parks and conservation areas. Some of our favourite places are Rockwood Conservation Area, the Bruce trail, the Elora Gorge, Burlington beach and Niagara Falls. Of course we go into Toronto quite often for the excitement and for the biking. Located high above the rest of Ontario on top of the Niagara escarpment we seem to get a lot more snow than surronding areas (like Milton). The escarpment is a large elevated formation or ridge running through Ontario and along the edges are some great waterfalls (some of which we have visited). To get into Acton you have to drive up the escarpment. In fact we are so high up we like to think of Georgetown as "lower Acton." Some of the roads up the escarpment are pretty exciting to drive on - our favourite is Appleby Line. No trucks or buses are allowed on the route and if you drive it you will know why. 2008 - Acton's Trunk Sale starts up again on the weekend after the May long weekend and continues until the weekend before Thanksgiving. Located right beside the Olde Hide House. The trunk sale is on most Saturdays from 8 am to 1 pm during the summer months. It costs about $10 to bring in your car and sell items from your trunk - more information can be found at (519) 853-4299. 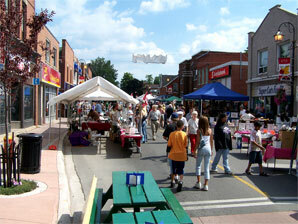 Acton will hold the "Taste of Acton" on Saturday June 14, 2008 presented by the Acton BIA. The event will be in downtown Acton (Mill Street from Main to John Streets will be closed) and will run from noon to 4 PM. The planned activities are a classic car show, walking tours, sidewalk sales and sampling of food from Acton Restaurants. Come on down and enjoy the day! During Canada Day celebrations (July 1) Acton put on a great day of entertainment at the Fairy Lake park. Canada Day July 1, 2006 in Acton started at 6:00 PM with some local singers taking part in "Acton Idol", country singer Alysha Brooke and some comedians providing a great afternoon of entertainment in Prospect Park. Later in the evening the Firefighters performed their annual fireworks display (no admission charge - donate at the gate). At 10 PM the Halton Hills Fire Department put on some great fireworks. See pictures here. We also couldn't wait for the Leathertown Festival to come to town.The Leathertown Festival, scheduled for Sunday August 10, 2008, is held in downtown Acton from 11 AM to 5 PM. See some festival pictures here. The Acton Fall Fair will rolled into town on the September 19 weekend (Friday to Sunday - 19, 20 and 21, 2008), located within Prospect Park the Fair is worth the drive from the Hide House to the Park. The 2006 theme was "MOOving ON!" 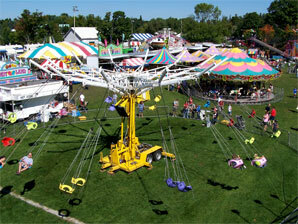 Call 519-853-4699 for more information regarding the Fair. Here are some of my pictures from the previous Fairs. 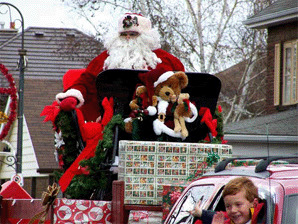 The Santa Clause parade is scheduled for Saturday, November 15, 2008 at 1:00 pm. For past parade pictures see here and here. The Acton BIA holds a great Old Fashioned Christmas in downtown Acton on Saturday December 6, 2008 - come out for some hot chocolate and a horse drawn wagon ride. You can find more event (official time and dates) information on the Acton BIA (business improvement association) website. Doing an excellent job supporting the event in 2005 were our elected officials including Mayor Rick Bonnette (left) and Member of Parliment (Wellington-Halton Hills) Mike Chong, M.P. For more Acton information, including a store index along Highway 7 and photos of Acton please go here. If you have an Acton store or restaurant and would like additional information and pictures to be shown on this website please do not hesitate to contact me. I can drop by and gather photos and information.